Did you see what the Eastern girls did at the Don Danser Relays at Lenape High School on Saturday?? Eastern dropped a NJ#6 all-time 59.52 to win the shuttle hurdles, won the 4x200 in a NJ#19 all-time 1:40.46, and won the 4x100 in 48.88. All three performances are No. 1 in the state this season!!! Eastern also won the SMR in 4:14.38, No. 2 in the state this season, captured the 4x800 in 10:22.00, and finished first in the the DMR in 13:07.29. Jailya Ash, the indoor Meet of Champions 55 dash winner this past winter, and her sister Jewel Ash ran on the shuttles, 4x100, 4x200 and SMR. 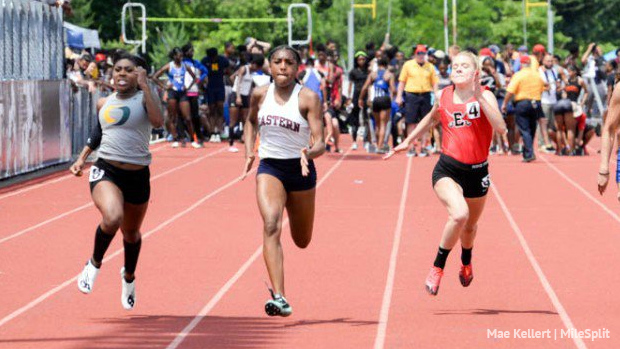 Dariyah Corbett-Collier ran on Eastern's shuttles, SMR, 4x100, and 4x200. Teghan Sydnor was a member of the 4x100, 4x200, and DMR, Kylie Dawson ran on the SMR and DMR, and Noelle Scott ran a leg on the shuttle hurdles. In the boys competition, Jabari Higgs of Haddon Heights soared a NJ#1 22-7 3/4 in the long jump, and ran on the first-place shuttle hurdles (1:05.50). 17 performances met the MileSplit US Second Team standard.